When attempting an automatic upgrade of iTunes from version 9 to 10, I got a pop-up saying "Service 'iPod Service' (iPod Service) could not be installed. Verify that you have sufficient privileges to install system services." The solution I found was to download the installer only and run it manually. Here's a step by step guide of the problem you are likely to see. Before carrying this out, please back up your catalogue - I'm not responsible if you lose your music! 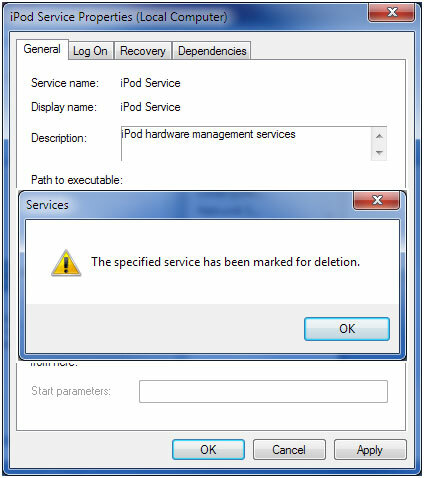 When installing iTunes, you get an error pop-up "Service 'iPod Service' (iPod Service) could not be installed. Verify that you have sufficient privileges to install system services." Without pressing any of the buttons, open the services manager by clicking the start menu, right click 'computer' and choose 'manage'. Navigate through "Services and Applications" then "Services". Find the iPod Service. You should find that the iPod Service is stopped and disabled. Double click the service to see its properties. If you make any changes to the service (try changing it from 'Disabled' to 'Automatic' and press apply), you will see that "The specified service has been marked for deletion". It seems that the service needs to be deleted to allow the new version to be installed, but for some reason it hasn't. The service will be deleted if you restart your computer though. Did I mention you should back up your catalogue before doing this? Without cancelling the current iTunes installation, restart your computer. If you do cancel the install, iTunes will roll back to where you were before you started the install and the service will not be marked for deletion. After your computer reboots, run the installer again and follow the prompts, it should install fine. In my case, all my music was still there. But if not, you can restore from the backup you took earlier - you did take a back up, didn't you?!? I hope this helps you get iTunes 10 installed - let me know how you get on! Tony: This did the trick - Thanks! Neil: You are a genius. Thanks. oscar: Just one thing: How exactly do you back up your catalogue? lesault: Mike, thanks for the feedback - hopefully your comments will point people in the right direction if they see the same error you did. Dani: Wow! It actually worked :) Thanks so much! RHMartin: This bug is still present with iTunes 10.4.1.10 and your workaround still works, lesault. THANK YOU!Shame on Apple for not having addressing the problem by now. steve: Thanks helped me fix the problem. Brian: Same problem with iTunes 10.5. I saw that the iPod Service was scheduled for deletion. However, instead of just rebooting, I aborted the install and let iTunes revert back all of the changes it made. After the install was successfully aborted, I rebooted my PC. I checked the services and sure enough, the iPod Service had been deleted. I then re-ran the iTunes install and it worked perfectly. I just didn't feel comfortable rebooting my PC mid-install. I'm glad it worked, and I would have spent hours working on this without your article. Thanks! stefano: Thanks mate. I had already installed iTunes 10.2.2, however I followed your procedure, restarted and then re-run the iTunes installer and choosen 'rapair' All working fine now, thanks. phillin: Worked like a charm! Thanks very much. Iumie: Thanks very much for this! I took three days trying to fix that problem on my own and looked at several other forums to see if there was a way I could solve it... and this one did it! The amount of times I tried to reinstall iTunes is ridiculous! I did it in many different ways 6`7 times a day... ANYWAY, thanks a bunch! I'm really grateful that you posted a solution. lesault: Looks like a lot of people are rediscovering this post with the release of iOS5. I have heard that this fix still works for the new version. James Hays: I kept getting this error. I tried the above instructions and they didn't work. Finally, I uninstalled itunes, used revo uninstaller to clean itunes out of my machine, and then installed itunes after it was all over. An odd thing: itunes tried to install itself twice. The first time it worked fine, but the second time it gave me the exact same error as the one listed above. I aborted, and now itunes is apparently installed. Weird. Gordon: It worked for me and I still have my original library. Thanks for posting this fix and explaining the problem. Robert B: Thanks! Encountered the same problem when installing iTunes 11.3 (in-place upgrade from 11.2 to 11.3 kept failing so I downloaded the full installer). Jeff: yep, that did it. Restarted computer and right clicked the installer as administrator to launch. I chose repair as other in this post and the one discrepancy is now resolved.